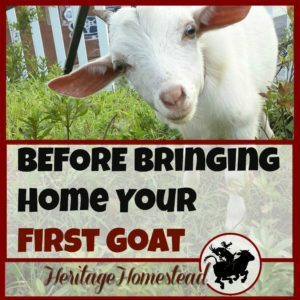 You need to know the best goat care during pregnancy. Pregnant does have many needs to support optimal health. You will also find a FREE goat gestation calculator. 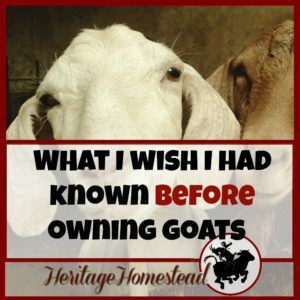 This is one post of many from our Raising Goats resource page. You gotta know when your cute, bounding baby goats are going to make their appearance so you can prepare adequately for them, right? 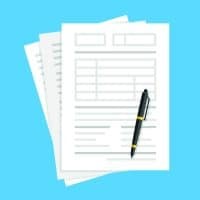 So take advantage of this easy goat due date calculator. The goat gestation period is between 145-155 days, with an average being 150 days. So, pencil the estimated due date into your calendar but remember to be ready for action during that last week before the due date! The standard breed of goat will have an average gestation period of 150 days. And the miniature breeds have an average gestation period of 145 days. Double click on the breeding date box and add in the date your doe was bred and the due date results will be displayed. 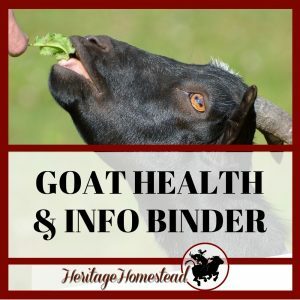 Below you will find information on printing out a very helpful worksheet to keep track of all the dates that need to be remembered throughout your goat’s pregnancy. This last year both of my does had triplets. We quickly realized that the first kid to arrive was backward and had died before delivery. The second kid was born in the correct position but the third was backward as well! We pulled that last backward kid as quickly as possible and all was well. The other goat, Ruthie, delivered her three kids without any issues. Thankfully! 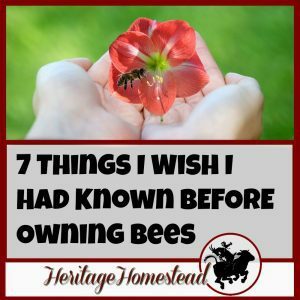 It was a kidding season that really ingrained into me the importance of being prepared…for anything. And you need to be prepared for “anything” as well. Get your kidding kit ready! 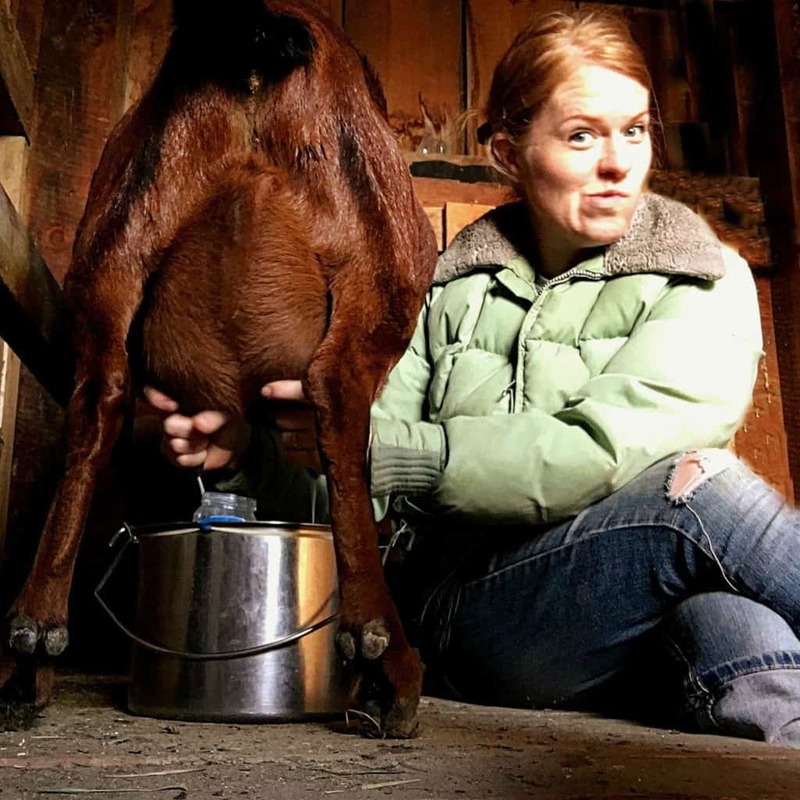 KIDDING KIT: Read this for a complete list of what you will need during a kidding season to prepare yourself and your goats for the wonderful process of bringing new life into the world. But what information do you need to know now during the 150 days your doe is with…kid(s)? Did you know that by day 20, the heart of your baby goat is already beating? Isn’t that truly amazing? Around 100 days, the tooth buds are erupting. And around day 115, the kid is covered in hair. 5 months of miraculous development. For the first three months of development, the fetus is no bigger than a small cat. But once it is completely developed it rapidly begins to grow and the nutritional requirements of your doe will increase. There are three trimesters for a goat’s pregnancy, about 50 days each. You will probably not see much if any, observable changes in the appearance of your goat. There are massive amounts of cell division going on during this stage of the pregnancy, so do not give any drugs during the first 30 days. Why? You could put the pregnancy at risk for birth defects. During any stage of a goat’s life, good quality hay should be provided, but especially during a pregnancy. It should be a top priority to keep stress out of the picture. Why? During this stage, any stress might cause the doe to reabsorb her fetus. 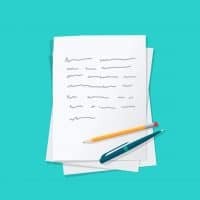 Below you will find access to the FREE printable to keep track of all the important dates to remember as your doe goes through her pregnancy. Print it out, fill it in and then get the dates in your calendar. You will also have access to 50+ other resources as well! And as your doe heads into the last trimester, it can certainly take a toll on her health. Here are a few things you will need to keep in mind as your goat enters the last stage of her pregnancy. If you have been milking her during the beginning of her pregnancy, you will need to dry her up 2 months before kidding. This allows for all of the doe’s energy to go into developing a healthy offspring and continuing to milk her would put unneeded stress on her body. She will need access to good quality hay. With the size of her kid(s) at this point, she is definitely eating for two (or more!). But each goat will probably be given a different measuring of grain. Why? Although the goat needs the extra energy to put into growing babies, you also don’t want the kids to grow so big that it complicates the delivery because of their size. Start at 1 cup of grain morning and evening and adjust from there. These feed requirements are so important because there is exponential growth happening and the doe needs all the nutrition she can get so she and the kids remain healthy. If her health is struggling, they are at risk for going into pregnancy toxemia, ketosis or hypocalcemia. What is Pregnancy Toxemia in Goats? Nutritional needs of a doe increase substantially during the last 6-8 week of pregnancy. Put simply, it is the result of the growing fetus placing demands on an overfat female who is actually in a condition of starvation. Which results in ketosis. For further reading: “Pregnancy Toxemia“. Please take some time to read and understand the prevention, symptoms to watch for and the treatment. Ketosis is a metabolic problem caused by an animal living on its own body reserves because it has stopped eating food. The higher nutritional needs of a doe continue as they did in the last weeks of her pregnancy because now she is producing large quantities of milk. So a doe in the early stages of lactation may experience a loss of energy. Usually, four to six weeks after kidding, the doe’s hormonal stimuli for lactation overcomes the effects of inadequate food intake. For further reading: “Ketosis”. Please take some time to read and understand the prevention, symptoms to watch for and the treatment. What is Hypocalcemia (Milk Fever) in Goats? Calcium deficiency. During pregnancy and lactation, the goat is not having her calcium needs met because of incorrect feeding. For further reading: “Hypocalcemia”. Please take some time to read and understand the prevention, symptoms to watch for and the treatment. • Enterotoxemia is caused by two strains of bacteria called Clostridium perfringens (type C + D). It is also called Overeating Disease: This bacteria is present in small amounts in a goat but when grain is increased, a protein supplement or a milk replacer is given or the goat is on new spring growth, the bacteria are given all the sugar, starch and protein needed to exponentially grow to cause toxins to be released in harmful and deadly amounts. The kids will be provided with tetanus immunity through the colostrum of the milk after the doe is vaccinated. • Also, give BoSe about four weeks before the due date if you are in an area with selenium deficiency. This will prevent white muscle disease in the kids. • Coordinate with your veterinarian if you need to be treating or vaccinating for miscarriages. This will really be dependent on the condition causing the abortions. For further reading: “Enterotoxemia and Tetanus and the CD&T Vaccine“. Please take some time to read and understand the prevention, symptoms to watch for and the treatment. One week before the due date, deworm the doe. They are at risk more than any other time and deworming them will ensure that they and the kids have the best chance of fighting off worms and keeping them at a minimum. Talk with your vet about which ones are safe to give during pregnancy. And there you have it! Phew! Although your doe puts in all the work in building cute kids, you can’t have a hands-off philosophy. Your job is to help her maintain a body in excellent condition with the feed and nutrition you provide. 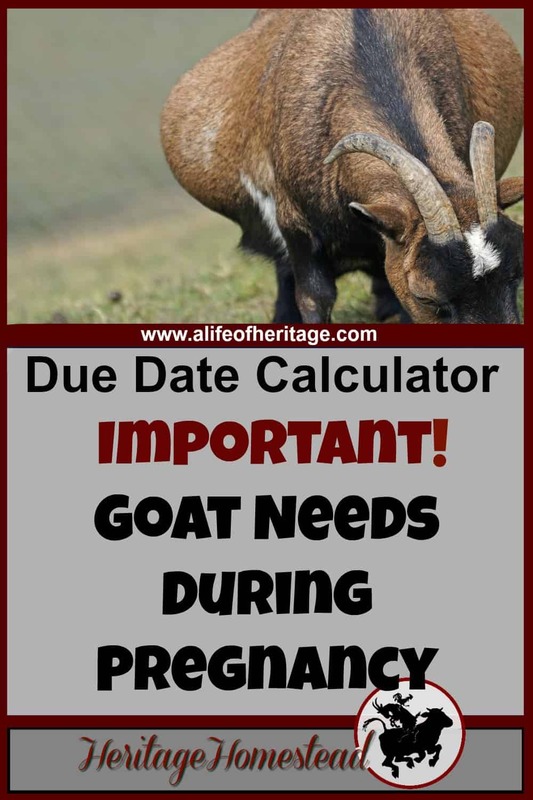 You can also find a goat pregnancy calculator here, and more information about goat pregnancy and care here and here.